Matthew Colwell of Escondido, California, is a goal-setter. One of his primary goals is to get a promotion at work, so when an opportunity for change presented itself recently, Colwell jumped at the chance to take his career path into his own hands. Colwell has been a member of the California School Employees Association (CSEA) Chapter 241 in San Dieguito, California for over 19 years. 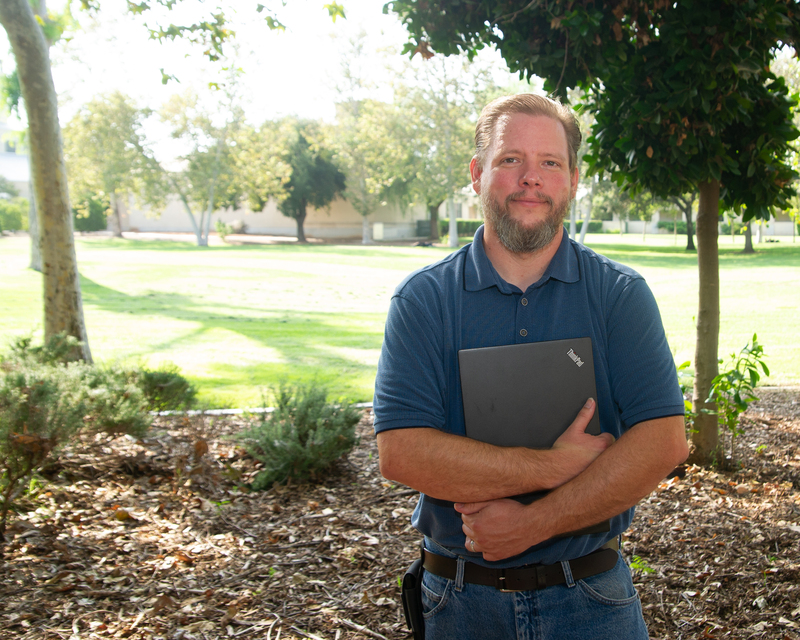 He is a network technician for the San Dieguito Union High School District and has put his hat in the ring for several professional advancement opportunities in the past. Colwell feels that his lack of college degree has held him back. “Getting a management level job is something I’ve had as a goal for a number of years and I just haven’t been able to promote into those opportunities,” he laments. When Colwell saw a Union Plus email about its Free College program, he saw his chance to succeed and began the enrollment process immediately. Within weeks, he was able to start taking classes towards a Business Management associate degree. The Union Plus Free College Program partners with AFSCME and Eastern Gateway Community College to offer online courses and degree programs with no out-of-pocket cost to active or retired union members and their eligible family members, including spouses, domestic partners, children (including stepchildren and children-in-law), financial dependents and grandchildren. A large part of Colwell’s decision to dive back into college coursework at this point in his career has been financial – he is enrolled free of charge. If all goes according to plan, Colwell hopes to pursue a bachelor’s degree once he has earned a promotion and has the financial resources to do so. Another benefit of the program that he emphasizes is the convenience of taking online courses. “It’s great being able to take courses from anywhere I have internet connectivity. If I had to go sit in a classroom and do traditional college-type coursework, I don’t know that I could do it,” Colwell admits. He is pleased with his experience both in and out of class so far. Colwell hopes his sons will take advantage of the Union Plus Free College Program when they are old enough, but in the meantime, he encourages his fellow CSEA members to use the program as well. He sees the program as a unique asset of his union membership. Colwell’s participation in the program embodies CSEA’s mission of improving the lives of its members. “Part of our union’s approach is to provide training and professional development opportunities so that members can better serve students and advance their own careers,” CSEA President Ben Valdepeña says.